Is the 200 Amp service worth extra expense? Is the 200 Amp service worth the extra expense? One of the most frequent questions the new home buyers ask is whether to get 100 or 200 Amp service for their new home. If you don’t have any 220-volt electricity hogs, such as electric heat, hot water tank, dryer, range or central AC a 100 amp service for a modest size home will serve most families. But this is the minimum service size allowed by the National Electrical Code, and you leave little room for future expansion. Adding 30% to the cost now may seem large, but if the time comes when you can’t do with 100 amps, replacing your new 100 amp service with a 200 amp service increases the price by approximately 30%. The National Electrical Code uses Volt-Amperes (VA) in calculations, but for a residence you can use Watts and be so close it doesn’t matter. Here is how you can get an estimate of your load. 3 Watts per square foot for lighting and general outlets; say 7500 for a 2500 square foot house. Now add electric dryer (5500), electric water heater (4500), electric stove or cooktop + oven (8500), two kitchen appliance outlets at 1500 (3000), laundry outlet (1500), two tons of air conditioning (3000 watts). Let’s add 6000 watts for your shop (6000). You probably aren’t running your welder and your saw at the same time. Total is about 39,500 Watts or Volt-Amperes. We are going to round it up to 40,000 to make the calculations easier. Now all of those things are not operating at one time, so the NEC lets you take 100% of the first 10,000 Volt-amperes, and 40% of the balance. So you have 10,000 + 0.4 x 30,000 = 10,000 + 12,000 = 22,000 Volt Amperes. Now 22,000 VA/ 240 Volts = 91.7 Amps, say 92 Amps. It is good practice to have 25% margin, and 125% of 92 Amps = 115 Amps. THAT IS YOUR LOAD, for the assumptions that we made. You may not have an electric water heater or electric dryer. You are limited to 42 breakers/circuits in a panel. A large 2-pole breaker to a sub panel counts as two circuits. 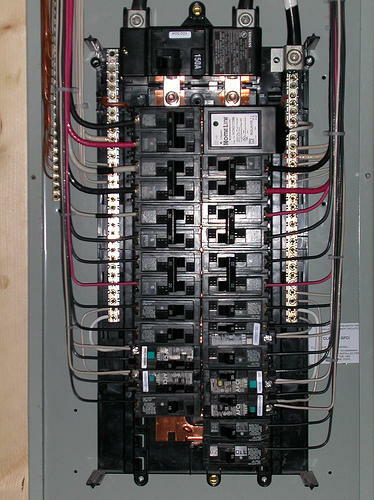 A tandem breaker (two breakers in one slot) is two circuits. You DON’T add the circuits in the main and the sub panel. You want to balance your loads. The 240 Volt loads on 2-pole breakers are automatically balanced. It is very hard to create unbalanced loads because breakers that are one-above-the-other on the same side of the panel are on opposite poles of the service. The easiest way to create an unbalance is to use large tandem 115 Volt breakers. Stay away from tandem 30 amp breakers. Another thought to consider, when selling the house some day you may find it an easier sell, and may make back your 30% and then some, with an attractive feature like a 200 amp service. One thing home shoppers don’t like to think about is the possibility of having to mess with the electrical system. Calculate Electrical Load Worksheet Download! Hey, great article on the differences between 100 and 200 Amp. Really great info 100 or 200 amp service. Thanks! Anywhere from $500 to $1000 depending on service. Will there be a difference in monthly Hydro One charges?